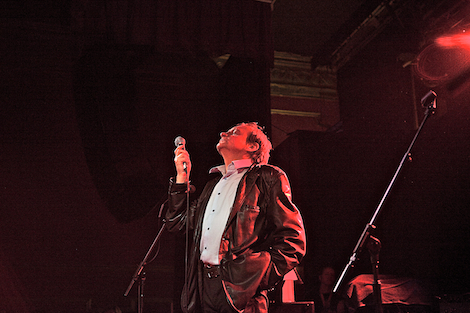 Masters of the unexpected, The Fall deliver a rousing display in an uncoventional setting. Getintothis Liza Williams is left intoxicated at Chester’s Laugh Inn. 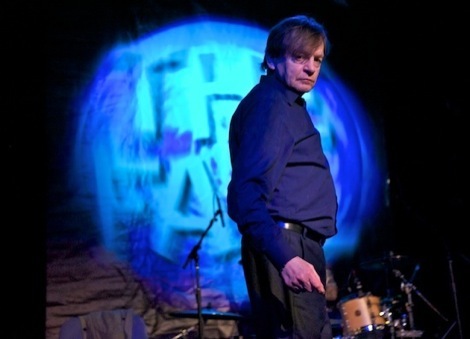 The Fall are experts at anticipation. 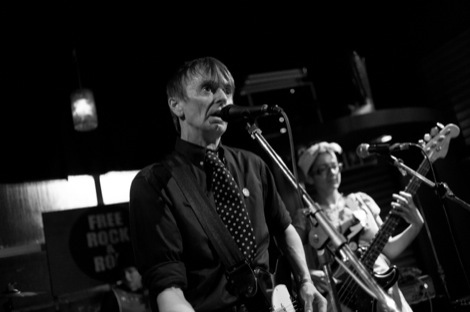 Whenever Getintothis has been lucky enough to catch Mark E Smith his entrance has never been immediate – a long build up involving odd imagery and looping sounds a constant feature. But during the launch of their 29th studio album, Ersatz GB, at Chester’s Laugh Inn the band took this build up to a new, and oddly hilarious, level. In short, it was a bigger display of Northerness than a George Formby ukulele convention. The night began in unassuming circumstances, with Salford all girl outfit Mr Heart impressing with bright, sparky and tight punk tunes. The crowd were a little frosty to begin with but the trio soon eased into their set, gaining confidence along the way. A quiz that followed, compered by the bald camp bloke from Johnny Vegas‘ show Ideal, knowingly took the night one step beyond a whippet in Weatherfield. Only when a contestant from Huddesfield in a checked shirt bellowed, without prompting, ‘Hit the North!‘ did we remember the comedy head-to-head on stage was not the reason we were there. The unexpected but not unwelcome comedy interlude paved the way for the main act, minus Mark E Smith. The anticipation was not yet over, the band making an entrance with their intoxicating sound only building up the excitement in the room further. And when the main man did finally make his entrance, everyone went mad. Using not one but two microphones he wandered around the stage, his unmistakable, incoherant vocals rolling out in a stream of conciousness. His magnetism on stage only increased as the show went on. The set was packed with a range of songs from down the years, much plucked from their new LP, but also highlights from other recent material including I Pick You. But they didn’t shy way from the old hits like they are known to do on occasion, and an encore of Mr Pharmacist went down a storm. It was truly great performance by the frontman and his band and big points go to organisers at the Laugh Inn for securing the date – Chester rarely hosts big bands, but a show like this proves it can work.